To readers of the blog who may not be familiar with you or your writing, can you tell us a bit about yourself and how you got into writing. My name is Jane Corry and I write psychological suspenses. They are about families whose lives suddenly change without warning. I am published by Penguin. My previous two books ‘My Husband’s Wife’ and ‘Blood Sisters’ got into the top 10 of the ‘Sunday Times’ bestseller list. I’ve always written for as long as I can remember. I began with poetry and little stories from about the age of three or four. After university, I became a magazine journalist for many years and then, after my first marriage ended, I took a job as a writer in a high security male prison. This made my writing darker! I then got married again which made me very aware of how family relationships can change. I wrote ‘My Husband’s Wife’ on the strength of this. A friend of a friend put me in touch with an agent who then sold it to Penguin. Vicki is an aromatherapist with a troubled past. One wet windy night, the police come knocking at her door. They ask when she last saw her missing husband. Vicki tells them it was five years ago. When they leave she picks up her mobile and calls him. Scarlet’s mother is a drug addict. Scarlet is taken into care at the age of eight. Each of my main characters tells her story until we get to the point where the two of them meet. If you were to start your own book club, what authors would you ask to join? I’d ask other writer friends like BA Paris, Kate Furnivall and Teresa Driscoll. I’d also invite Martina Cole because I interviewed her once and thought she had some great tales about the underworld. If it was possible, I’d also like to invite the ghosts of writers have passed away such as Helen Dunmore and Mary Wesley. What’s your favourite opening line from a book? “The mole had been working very hard all morning, spring cleaning his little home.”This is the opening line from ‘Wind In The Willows’. It was the first book which my father read to me. Now he is 94 and I read poetry to him. If you were starting your writing journey again, would you do anything differently? I’d have stopped being a magazine journalist in my thirties and begun writing novels earlier. It requires a leap of faith to give up a steady job and do something that’s quite uncertain. Bit it was worth it! My cousin Rachel in Daphne du Maurier’s novel with the same name. Some might say she’s not a villain at all but I’m not so sure…. What made you decide to become a thriller writer? It was partly my time in prison (see answer to question one) and also because I love creating twists and turns. I’m one of those annoying people who likes to guess what’s going to happen at the beginning of a book or drama. If you were stranded on a desert island, which three books would you bring with you to pass the time? The complete editions of ‘Trollope’. ‘The Bible’. ‘Palgrave’s Golden Greasury’. From books to films, what’s been your favourite adaptation? ‘Gone With The Wind’. My second husband recently took me on a road trip to the southern states of America. We were lucky enough to visit Margaret Mitchell’s house. It was a dream come true for me. I’ve always admired her. What area do you suggest a budding writer should concentrate on to further their abilities? When sitting down to write, what is the one item you need beside you? My dog. He sits on the sofa behind me and tells me when it’s time to get up and have a walking break along the beach! We have to wrap up warm as it’s really cold at the moment! And finally do you have any projects or releases on the horizon which you would like to share with the readers of the website? I’m currently writing next year’s book for Penguin. I can’t say anything about it right now but I live it in my head every day while writing. Actually, I will give you a clue! I became a granny two years ago and it’s changed my life. 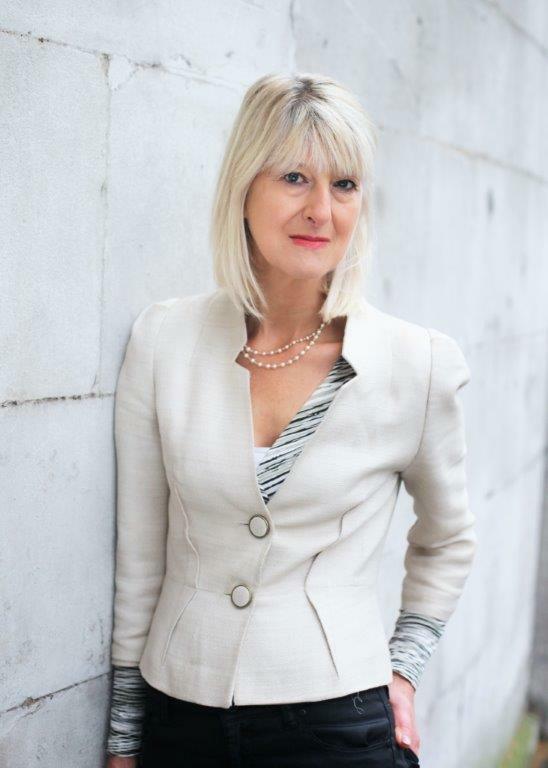 ‘Blood Sisters’ is the latest book by Jane Corry. 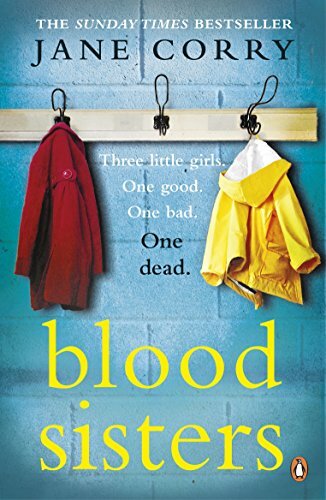 ‘Blood Sisters’ is Jane Corry’s second book and is just as gripping and dark as her debut novel, ‘My Husband’s Wife’, with quite complex and difficult characters, this thriller was easily devoured in one sitting. In the book, we meet sisters, Alison and Kitty, whose lives change dramatically when an accident happens when they are teenagers. The accident leaves Kitty in a care home with no memory and leaves Alison living with the guilt of the accident and feeling responsible for her Kitty’s disability. Alison tries to stay away from Kitty, as being with her reminds her of the guilt, so she keeps her visits to the care home to an absolute minimum, much to the despair of her mother. Alison loves art and finds a comfort and solace in creating, so when the unusual opportunity comes about to become an art teacher in a prison, she grabs it with both hands looking to make a difference to other people’s lives. But, it’s whilst she’s in prison, that she finds herself in danger not only within the confines of the prison walls but on the outside world. The thing that makes this book so interesting is the mix of the characters, there’s the quiet, soothing presence of Alison with her tragic past and then there’s Kitty. Kitty is quite the wildcard, she’s boisterous, outspoken and is frustrated by her disability. She gets fed up when people don’t understand her. As the story is seen through the narrative of both sisters, I found Kitty fascinating. In my mind, everything makes sense but to others, she speaks nonsense, and this angers her making her lash out. With her disability, Kitty is a great character, she’s wild, witty, with a sense of humour and says what she thinks, unconcerned of the outcomes. The story flows between the past and present tense leading up to the accident and gives us an insight into the type of person Kitty was before the accident and I found these scenes to be the most fascinating of the story. She was quite unlikable, spoilt and seemed to revel in making Alison’s life a misery. Atmospheric from the very first page, the story is cleverly written with hidden twists and turns throughout that will keep the reader on the edge of their seat. Chilling, suspenseful with the addition of unexpected humour, ‘Blood Sisters’ is a gripping psychological tale of sibling rivalry and dark secrets. You can buy Blood Sisters from Amazon and is available to buy from good bookshops. 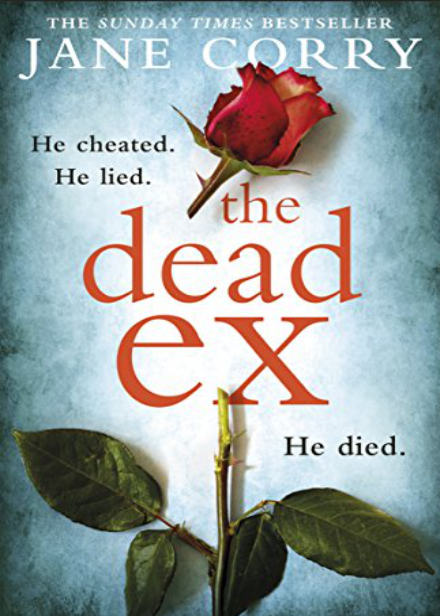 Jane Corry has revealed the name of her exciting new book for 2018 called ‘The Dead Ex’. He said in sickness and in health. But after Vicki was attacked at work and left suffering with epilepsy, her husband Daniel left her for his mistress. So when Vicki gets a call one day to say that he’s gone missing, her first thought is ‘good riddance’. But then the police find evidence suggesting that Daniel is dead. And they think Vicki had something to do with it. What really happened on the night of Daniel’s disappearance? I’ve just recently read Jane’s last book called ‘Blood Sisters’, which was a great thriller so I’m looking forward to ‘The Dead Ex’. You can pre-order The Dead Ex from Amazon and will be available to buy from good bookshops from 2nd August 2018. 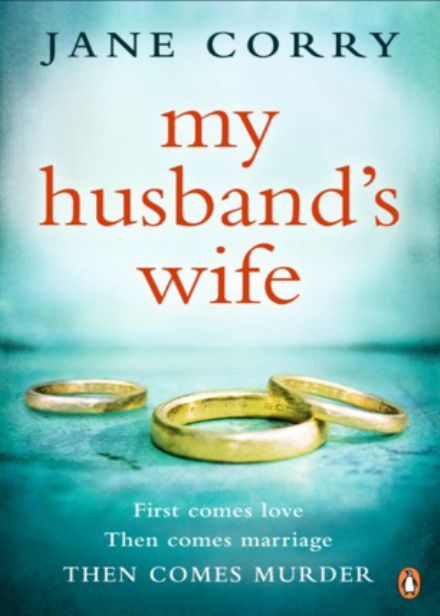 ‘My Husband’s Wife’ is Jane Corry’s first book. When lawyer Lily marries Ed, she’s determined to make a fresh start. To leave the secrets of the past behind. But when she takes on her first criminal case, she starts to find herself strangely drawn to her client. A man who’s accused of murder. A man she will soon be willing to risk everything for. But is he really innocent? ‘My Husband’s Wife’ is Jane Corry’s debut novel and it’s cracking introduction to this new author, I found the book so gripping that I spent my lunch breaks alone so I could read the book in peace. The story is seen through the eyes of Lily, a young woman who is just beginning married life and her career as a lawyer, who has been just given a challenging case of proving a man’s innocence when he is being found guilty off killing his girlfriend. it follows Lily has she pieces together evidence in the case as well as adjusting to married life. Her husband, Edward is a struggling artist and swings between moods as together the young couple clash as they both struggle in their professions. Meanwhile in the same apartment building, young Carla deals with her emotional mother and the bullies at her school who torment her for having no father. The young girl is friendless until one day, Lily helps her and the young couple become friend with the little girl and Edward even uses Carla for inspiration for his paintings. Chapters alternate between both Lily and Carla and begin in 2000 and span over 17 years as Carla become an aspiring lawyer like Lily who she looked up whilst growing up and Lily who is now a successful lawyer in a loveless marriage with a troubled son. This book is thrilling from the start, as Lily prepares for the case of her life and help prove a man his innocence, as she gets embroiled in the case, both emotionally and intellectually. As the story progresses, it’s gripping seeing the characters progress, as both women grow in confidence and blossom. What I loved about the story was that were so many twists and turns in it, there was murder, betrayal and love and all those elements make this story a dark and atmospheric read. An observant and insightful book about the dramas of marriage and society, this psychological story was a cleverly written tale. Riddled with tension, deceit and morals, ‘My Husband’s Wife’ is a tremendously chilling story that really hooked me in and had me guessing till the very end. You can buy My Husband’s Wife from Amazon and is available to buy from good bookshops.